Enjoy Dressing Up in the Kitchen with Our Vintage Children's Cupcake Pattern Apron Set and Chef's Hat. Our vintage cupcake patterned kids apron evokes all the sentiment of a home filled with the aroma of freshly baked cookies. Some things have changed, but this cupcake apron set will never go out of style. 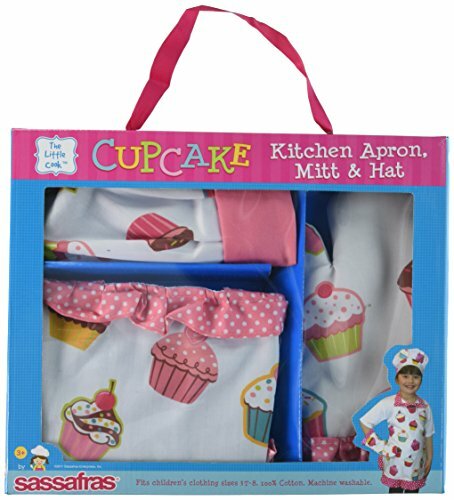 Our Kid's Apron Cooking Set includes Cupcake Apron, Adjustable Chef's Hat, Kids Oven Mitt and a BONUS Cooking Whisk. This Children's cooking apron and chef's hat set are recommended for ages 5 and up. CHILDREN'S APRON SET The Little Cook Ruffled Cupcake Apron Set is as much fun to wear as it is to bake. ADJUSTABLE Children's Apron has Adjustable straps that fits kids as they grow through their younger years. KIDS CHEFS HAT Children's Chef's Hat has an Adjustable Velcro closure on hat makes it comfortable and easy to wear. VINTAGE Enjoy the adorable vintage 1950's look of our Children's Cupcake Pattern Apron Set. WASHABLE Our Children's Apron Set is Machine washable in Cold water. Make lasting memories in the kitchen cooking with your kids and this vintage children's cupcake apron set. Fits children age 5 thru 8 and has an adorable vintage 1950's ruffled look. Adjustable straps that fits kids as they grow through their younger years. Chef's hat for children has an adjustable closure on hat that makes it comfortable and easy to wear. If you have any questions about this product by Sassafras, contact us by completing and submitting the form below. If you are looking for a specif part number, please include it with your message.